Seven-year-old Thiago Torres lives and breathes football and he has overcome adversity to put on a Barcelona shirt. A love he has had since he was three years old, staying up to watch Barcelona play, also a burning desire to play football “I would love to meet Messi and one day be like him”. Four days after being born, Thiago suffered from an ischemic stroke and doctors didn’t give him much chance of surviving. Doctors said chances of survival was slim and, if he did survive, the stroke would have an effect on his life and that he would barely be able to walk. 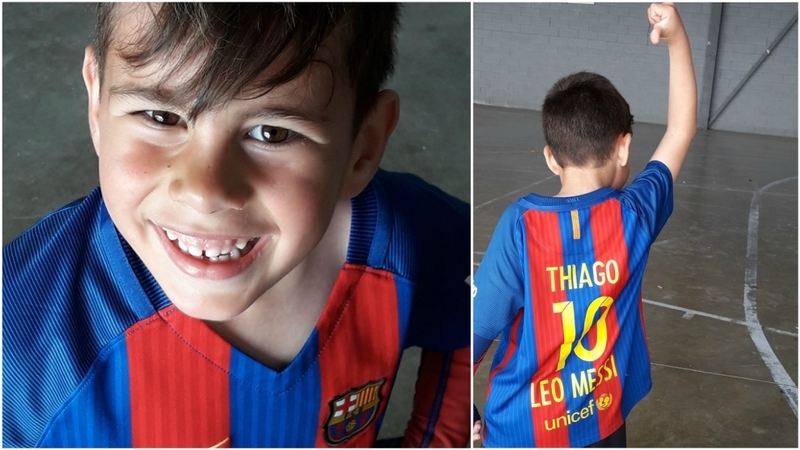 Seven years later, Thiago can walk, run and even play the sports he loves so much, something Barcelona has a hand in, he is part of Barcelona‘s Escola de Perfeccionament. Despite this, Thiago is left-footed and prefers to use his right foot as his standing foot when shooting because he feels more balanced. Last Friday, Thiago was given a birthday surprise by Barcelona‘s Rafinha who gave him a shirt signed by the senior squad. Thiago will be one of the eleven youth players that will walk out with the senior team at the Camp Nou as a mascot before the game with Real Sociedad on Saturday, 20th, April 2019. A day he’ll meet his idol ‘Messi’.